Will wood products of the future be stronger than steel? Transparent? Will biodiesel fuel more passenger flights? Our quest to reduce the effects of climate change is driving a new era of technological advances. On the cutting edge of this wave of innovation are new uses for a material with a long tradition: natural, carbon-friendly wood. The modern uses for wood and wood-based compounds are changing how we build and design in ways that our grandparents could not have imagined even just one generation ago. Cross-laminated timber, or CLT, is a wood product developed in the 1990s. 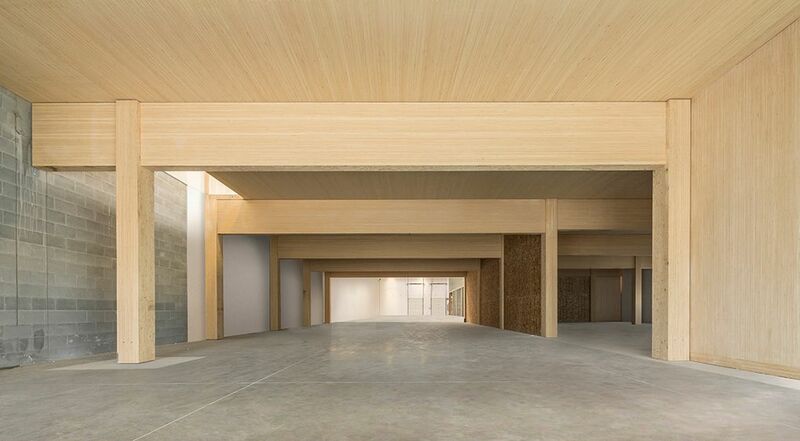 Made from gluing three to nine layers of solid-sawn lumber, each layer of wood in a CLT board is laid at right angles to its adjacent layer, then compressed and bonded together. The result is a building product that is remarkably strong, resilient and versatile. CLT also allows for the use of less-than-perfect boards to make better use of every piece of cut timber. The environmental perks of CLT have captured the imagination of city planners and architects alike. In addition to lowered carbon dioxide emission during manufacturing, CLT also stores carbon for longer periods. Overall, buildings made with CLT result in a 25 percent to 30 percent reduction in greenhouse gas emissions compared to traditional building materials. From a practical perspective, CLT is very fire resistant — in the event of fire, the outer layers scorch and carbonize, insulating the inner layers from the high heat that causes ignition. CLT is also lightweight, compared with traditional wood products, offering reduced construction costs in terms of labor and transport. Washington state is primed for an era marked by carbon friendly CLT building. This year, the state Legislature passed SB 5450, which supports the expanded use of CLT as well as other innovative mass-timber products. SB 5450 requires the State Building Code Council to adopt rules for the use of mass-timber products for residential and commercial building construction. Pilot projects using locally harvested CLT have already been built or have broken ground, including the building of classrooms in Sequim, Mount Vernon, Wapato, and Toppenish as well as a new Amtrak station and a 14-story high-rise building, both in Tacoma. Currently, airlines produce 2 percent of the world’s greenhouse gases. This is projected to increase to 3 percent by 2050. Making planes greener is a unique challenge because methods like solar-, electric- and hydrogen-propelled aircraft are currently not feasible in the near or medium term: commercial planes require a very high power-to-weight ratio for flight. Biofuel may be the answer airlines are looking for. Many experts consider biofuel the primary way for airlines to reduce their carbon footprint. NASA estimated that a jet fuel blend that is 50 percent biofuel could cut air pollution caused by air traffic by 50 percent to 70 percent. Biofuel is produced through biological processes rather than the geological processes that create fossil fuels. Biofuels can be made from plant materials, such as tree refuse, as well as from agricultural, commercial, domestic or industrial wastes. Biofuels are a carbon-neutral energy source. In November 2016, an Alaska Airlines flight between Seattle and Washington, D.C. made history by being powered by a jet fuel blend that contained 20 percent biofuel made from wood scraps — limbs and branches — from Pacific Northwest trees. Just last year, Norway’s Statkraft made biofuel from a hydrothermal liquefaction process that turned wood and organic waste into biodiesel. Made from wood and other waste, the biofuel did not rely on large land mass for its production. The result was a carbon-neutral fuel. Experts believe that increased biofuel adoption would also contribute to the local economy, particularly in rural areas of the state. According to Washington State University’s Northwest Advanced Renewables Alliance (NARA), one biofuel plant in the Puget Sound region would create more than 1,900 jobs in biomass harvest, transportation and fuel conversion. NARA estimated that the economic benefit would be $650 million. Wood of the future: Stronger than steel? Transparent? Some major advances in wood technology read like excerpts from a science fiction novel. Yet these emerging technologies are as real as it gets. In February of this year, scientists from the University of Maryland in College Park released a study on a wood material that is stronger than steel. By processing wood through a chemical bath to remove some of its polymers and compressing it, researchers have created a potentially eco-friendly alternative to plastics and metals. In some tests, this wood material has stopped bullets, making it viable for creating bullet-resistant armor plates. A team at the KTH Royal Institute of Technology in Stockholm has also found a way to make transparent wood. After the removal of lignin, which makes wood stiff and also brown, KTH researches injected a Plexiglas polymer into wood, creating a material that is clear and transparent. This material is lightweight and strong, making it a good candidate as a building material for light-transmitting buildings and transparent solar cell windows. The Washington Forest Protection Association is a trade association representing private forest landowners in Washington State. Members are large and small companies, individuals and families who grow, harvest and regrow trees on about 4 million acres.